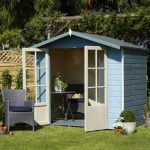 This is an excellent size wooden shed which is constructed out of hard wearing and long lasting timber with an overlap cladding for extra durability. 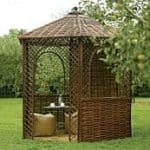 It has large, double doors allowing easy transport for the larger items of garden equipment and has six styrene windows giving plenty of light and air. 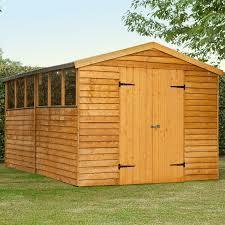 Use as a shed or as a workshop it is ideal for either purpose. 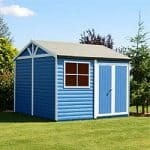 The inside is big enough for plenty of tools, toys and furniture and it is an attractive looking building with an apex style roof. 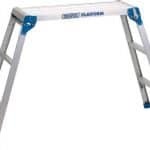 The dip treated wood has a 10 year anti rot guarantee. 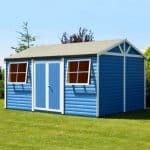 This shed comes home delivered.